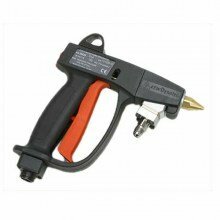 Hot Melt Hand Applicator is designed for flexibility, connecting to the adhesive supply hose through either a ball swivel fitting or an axial rotation (rotary) fitting. Adhesive output may be oriented for straight or right angle application with a variety of available bead and spiral spray nozzles. The DG2 applicator can be fitted for a two- or four-fingered trigger, and set up for bottom-entry or top-entry hose connection. Easy to change cartridge-style heater and sensor. Two- or four-finger trigger with built-in trigger lock. Straight or right angle nozzle adapter. Bead or swirl applications. If you have any questions about this product by Astro Packaging, contact us by completing and submitting the form below. If you are looking for a specif part number, please include it with your message.